Hi friend! I hope you’re having a fantastic week! Sorry it’s been so quiet around here the last couple of weeks. I had to fly out to the east coast for a family illness and was focusing on spending time with my loved ones and so the blog fell a bit to the wayside. Thank you for your patience and love while I catch up on my work and life! This experience reminded me that during stressful times your body is put under intense amounts of pressure and it’s easy to end up sick and exhausted, which is why, even though it’s summer, I’m sharing a recipe for a delicious & nourishing flu broth. Once I get back from my retreat this weekend I am going to be mainlining this dish like it’s going out of style! I like making mine with kelp noodles to give it a bit more substance, but you can easily add whatever you’d like to this recipe. If you want a complete meal add a little chicken or tempeh for protein. 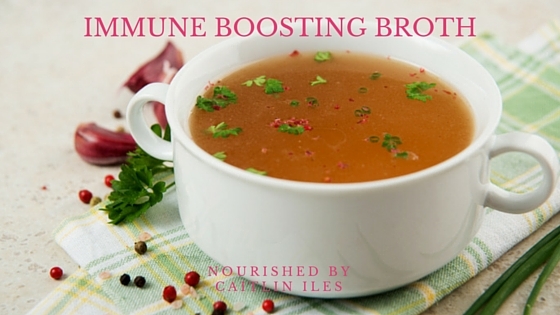 Bone broth is a wonderfully nourishing food that can help boost the immune system and ward off chest colds and flus. You can read more about it here. Using it as the base of soups and stews is a great way to incorporate a really nutrient dense and super affordable food into your regular diet. Simmer on medium heat until warmed through and seaweed/kelp noodles are softened. Pour into a mug or bowl and enjoy! Make as many bowls as necessary to warm you from the inside out and help ward off those nasty colds. Well friend that’s our post for today! I’m off to Langley to spend the weekend with an amazing group of people where we’ll be doing yoga, meditating, making delicious meals, doing workshops, and relaxing. If you are really looking to super charge your immune system, make sure you download my FREE Fantastic Fermentation E-Book by clicking here. Have a wonderfully, whimsical weekend!